We are committed to supplying product solutions for a multitude of applications, and many of our products are used within the agricultural industry, for water storage, fuel containment, biogas extraction, hazardous material containment, and fire suppression (like barn fires, brush fires, and livestock hazards). Mars corrugated tanks, poly tanks, and Argo water trailers are solutions for these containment needs. 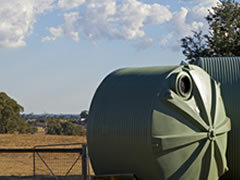 Mars corrugated tanks offer a bulk water solution for your agricultural or fire suppression needs. These field erected water storage tanks are made from a galvanized or Zincalume material and are commonly used for rainwater storage. They can also be outfitted for a variety of other tasks including potable and non-potable water storage, black water and gray water containment, oil storage or containment, aquaponics, grain storage, gas extraction, as well as irrigation management. For storage of liquids other than water, please email us a Safety Data Sheet (SDS) outlining the concentration and specific makeup of the liquid to be stored so that we can check chemical compatibility. When optimized for dual use water storage, a standpipe is placed on the interior of the tank to maintain a standard, operational volume of water for fire suppression, with additional volume available for domestic or industrial uses. As a result, there is always a reservoir available for firefighting to protect your livestock and farm from barn or brush fires. Additionally, these fire protection tanks are designed, constructed and installed according to NFPA (National Fire Protection Association) 22 standards. Corrugated steel tanks are impact resistant, UV resistant, and can be lined with a selection of materials to appeal to other agricultural needs. Furthermore, they are cost effective and save space, which leads to more room for crop growth or livestock range. Additionally, open bottom corrugated steel tank styles make for ideal livestock watering sites, or as a preventative berm for stopping the spread of harmful materials, such as oil, black water, or gray water. Constructed from FDA-compliant polyethylene resin and with a UV stabilized coating, our vertical poly tanks are a multi-use fire suppression tool for those in the agricultural industry. The design of the poly water tanks from GEI Works are ideal for storing potable water. Because of their UV protective coating, as well as the dark green or black coloring of the polyethylene resin material, growth of algae within the tank is significantly reduced. Additionally, white rotomolded poly tanks are also available. Fabricated in a range from 305 to 10,000 gallons, they are ideal for specific watering or livestock needs, or larger bulk water storage uses such as emergency supply, disaster response, and firefighting. Also available are other polyethylene products for agricultural applications such as Bull Feeders, Troughs, or Open Top Tanks. 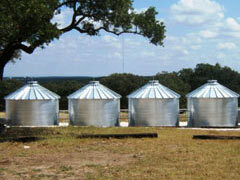 Argo water trailers, also known as water buffalo tanks, are an ideal portable water storage solution. They are especially useful on larger tracts of land or in more remote areas where potable/non-potable water sources are in short supply. With the choice between a 500, 1,000, and 1,600 gallon water tank on the water trailer, they can deliver a bulk water solution to many areas otherwise inaccessible. During dry seasons, the risk of dust erosion and wildfires greatly increases, but the rear spray bars on the Argo water trailers can be used to douse land, shrubbery, plantings, fields, roadsides, or arenas. The placement of these nozzles at the back of the water trailer reduce the spread of dust, water plantings, and mitigate fire risks on rural and agricultural land. Additionally, Argo water trailers' mobility is an advantage when conducting controlled burns, as it can quickly adapt to changing situations and deliver water on-demand to burn locations. Along with the standard 500, 1,000, and 1,600 gallon models, customized trailers and skids have been produced with larger tanks, higher-capacity pumps, and aluminum decks. Let us know what your projects needs are, and we can manufacture to suit your specifications. If you have questions about our agricultural water storage solutions, feel free to give us a call at 1-772-646-0597.